When surveying business owners and entrepreneurs, I've found that the #1 obstacle in marketing their businesses via social media is simply time management. Running a business is extremely time-consuming as is without having to market and advertise as well. Here I've put together a list of tools that can help you save time when reaching your existing and potential new customers online as well as increase your online reach. I've met people who have been Facebook Page admins for years and still somehow do not know that this tool exists within Facebook. Facebook's Post Scheduler is truly a life-saver for those who cannot afford to be glued to their computer all day. 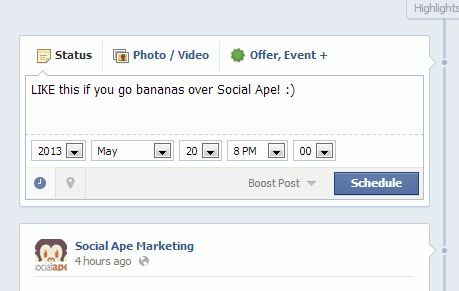 To access the scheduler, create a post within the status update box on your Facebook page. Then simply click on the icon on the bottom left-hand side of the post that looks like a clock as seen in the screenshot below. Picmonkey is a great tool for creating and editing content for your social media marketing. For those of you who are not proficient in Photoshop, Corel or other photo-editing software, this site is great because it is very user-friendly and simple. With Picmonkey you can create collages to showcase several of your products at once or edit a photo of a product or service with text, overlays, logos or patterns to create great-looking content. See the examples below for some content inspiration! Although Hootsuite has now been a mainstream social media tool for years, it is still one of the easiest social media monitoring tools to manage while being extremely effective at the same time. Hootsuite is an excellent tool for listening to what consumers are saying about your brand and your industry as well as a life-saver when you have more than one social media account to manage. This tool allows you to see all of your network streams within one dashboard; therefore, eliminating the need to toggle back and forth between multiple screens. You can also schedule out posts or tweets for future dates as well as bulk-uploading. Bitly is a tool that not only shortens the links to content that you post, but also tracks the number of click-throughs of those links. Posting Bitly links can help you to discover which content works best for you and your company as well as the days or times of day that your links are being clicked more often. It's a very simple tool for those who don't want to bother with analytics for their own website or just want to discover how many people have clicked on certain links. Below is an example of a link tracked through Bitly. Reading analytics graphs and reports can sometimes be overwhelming for those who don't care for numbers but if you're are an admin of a Facebook page, it is very beneficial to keep an eye on the analytics of your Facebook page, also called Facebook Insights. This information can be found at the very top of your Facebook business page in the "Admin Panel". In the bottom center box of the Admin Panel you will find the Insights for your page. Click on "See All" to dive into the analytics that are provided. This information can tell you a lot about your Facebook page: What is the demographic of my fans? In what city am I reaching the most people with my page? Which Facebook posts perform better than others? Which days do my posts fare better? Which posts caused Unlikes on my page? Knowing which information to look for and how to interpret this data can give you a leg up on your competition and also make your efforts much easier and more effective. Buffer is a pretty neat tool (similar to Bitly) that allows you to pick ideal times for your posts or tweets to go out (only for Twitter, Facebook and LinkedIn) and then simply "buffer" the content that you want to share to go out at those assigned times. Buffer has just recently teamed up with Followerwonk so the app can now send out your posts based on the times that your posts perform the best. The free Buffer account only allows a user to connect one account on each network but the paid version (at $19/month) allows up to 12 additional accounts. Whether you are just getting started with your social media marketing or have been at it for a while, these free social media tools can help to save you time as well as streamline your efforts to produce measurable results. If you would like to schedule a Social Media Training Session to go over these tools more in detail, please email me at april@socialapemarketing.com.